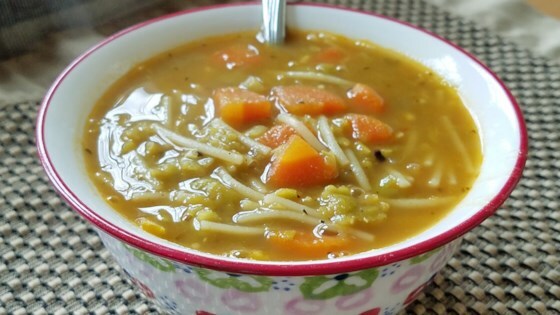 "Pressure cooker version of split pea soup for vegetarians. Smoky flavor added using chipotle peppers." Bring a medium-size pot of salted water to a boil, add orzo and cook until al dente. Drain well. In a large skillet, saute onion, celery, garlic, and carrots in olive oil for 5 minutes. Place vegetables, vegetable broth, peas, thyme, chile pepper, salt and pepper in a pressure cooker. Cover. When pressure cooker reaches full pressure, cook for 10 to 12 minutes. Remove the pressure cooker from the heat. Add cooked orzo and serve. Note: If you would like creamier soup, puree soup in a food processor or blender. Add additional broth to bring the soup to the consistency you desire. it was great, even my kids said it was good,and that means alot. I cooked it stovetop for 2 hours instead of a pressure cooker. Perfect combination of spices and herbs! I replaced pasta with 2 medium size patatos though. TRY THIS on the stovetop w/out pressure cooker and without soaking! It's easy and tastes better than anything in a can! Skipped the pasta, too. Great. This soup tasted pretty good, but I would leave the pasta out next time. It was really thick. I pureed most of it and I might puree less of it next time. this was the first soup i made from scratch and it was delicious! My boyfriend loves it and I do too, I make it in the crock pot turns out great!